When the innermost layer of a tooth, the pulp canal, is damaged it may develop a bacterial infection. 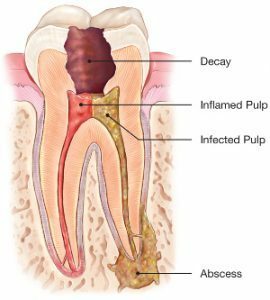 If this infection progresses, it can decimate a tooth’s interior pulp of nerves and blood vessels, increase blood flow, and form pus. This process raises the pressure within the tooth causing a great deal of discomfort. At Crystal Coast Dentistry, we are able to provide root canal therapy for many cases but may refer patients to an endodontist if their condition is complex.